How Can I Listen When I Don’t Want to Hear? Blah, blah, blah. 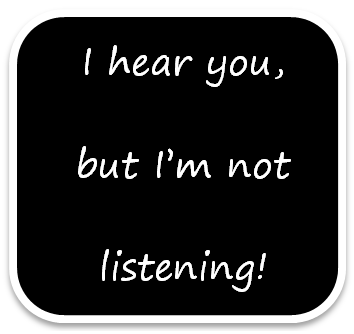 Sometimes my ears hear a lot of blah, so I don’t want to listen. Sadly, the person saying the blah blah may be somebody I shouldn’t ignore—a boss, a parent, a child, a teacher, even a friend. Sometimes I know I’m going to want to remember what was said, even if I don’t want to hear it. What can I do to hang in there better? Listening is like a kiss. If you just hold still and don’t do anything, not much happens. You’re left without much to remember. Of course, if you really want to hear what the other person is saying, you’re going to work at listening without realizing you’re doing it. Great kiss. That’s no problem. But let’s pretend your significant other is telling you about his day. Uh oh. You know there’ll be a quiz at the end. He’ll ask what you think and there you go. You’re in trouble. You have to force yourself to concentrate and see if you can pick up the names and big ideas—kind of like making a study cheat sheet for yourself. Or, what if you’re supposed to be listening to directions or even a lecture—endless details? Egad. Time to make some notes—on paper, on your cell, someplace. Otherwise, by the end of the week you won’t remember anything but what a pain it was to try to listen. What if the situation is more complicated, and your significant other is telling you why she’s mad at you. Secretly you think she’s exaggerating, and you don’t want to talk about it anyway. But this is where you decide if you want this problem to go away or get worse. If you listen, you prove you care—major relationship bonus points. Second, you find out what’s making her so crabby which is the only way you have any hope of fixing it. Third, you give yourself a chance to see where the two of you can compromise—I’ll do this if you’ll do that. Why do you want to let your teen or lover or parent know you listened? If you talk as if you’re two adults having a discussion, you have a better chance of having the other person respond as an adult. If you give in to the overwhelming urge to just TELL HIM WHAT TO DO, you sound like a parent. That means the other person is free to act like a child. The odds that your outcome is going to be pleasant are lower. In another article, we’ll talk about how to decide what you say next after you listen. You can improve your outcomes immensely if you do a little thinking before you speak. This entry was posted on October 19, 2014 by Personal Journeys with Gramma in Dear Gramma and tagged Commitment, Common Ground, Communication, Compassion, Compromise, Concentration, Dear Gramma, Equality, featured, Focus, Hearing, Listening, Perspective, Reiteration, Relationships, Thinking.